Then, dive after dive, air consumption is getting better, our ability to look is improving and we start to watch things in a different way. You learn to look there, just ahead. Few centimeters of wonder (sometimes millimeters). With practicing, eyes get sharper and relish becomes clearer. Thus, everyone can choose his favorite topic. So much so that some divers live each dive as a treasure hunt, looking for THE creature, which is not in their picture collection yet. We should logically talking about MICRO diving (etymol. “very small”). But, refering to the very magnifying lenses used by photographer, we talk about MACRO diving (etymol. “great”). These last years, a new type of macro diving’s appeared: the “muck diving“. Not very glamorous, is it ? However, most of the best macro dives take place near sandy shores, in protected and muddy bays, in shallow mangroves or backwaters. Where can we do macro diving in Bali ? 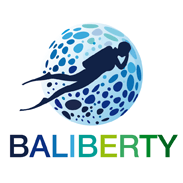 But Baliberty has made its own selection of macro dive sites, off the beaten track. These exclusive dive sites will delight photographers who are seeking something different and new. What do we need for macro diving? Some divers wear gloves to protect themselves. But it is also an easy way to touch everythings without any risk. Unfortunately, few dive guides return the stones to find out small creatures and satisfy their divers. That is not the way we dive with Baliberty! The main rule underwater that has to be respected : DO NOT TOUCH! To be more careful, we prefer not to wear gloves. In the same way, we avoid using of metal sticks to poke feather or tickle octopuses. We do not touch anything, we only take pictures and we only leave bubbles!